Individuals who achieve Cloudera Certified Developer for Apache Hadoop (CCDH) accreditation have demonstrated their technical knowledge, skill, and ability to write, maintain, and optimize Apache Hadoop development projects. 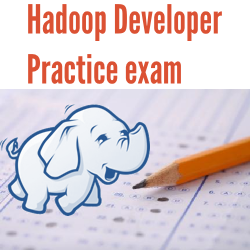 This course provides access to CCDH practice exam for candidates to self-assess their exam-readiness against the full course of certification objectives focusing on engineering data solutions in MapReduce and understanding the Hadoop ecosystem (including Hive, Pig, Sqoop, Oozie, Crunch, and Flume). 50 questions simulating live Cloudera Certification exam with 90 minute time limit. Rich pool of 90+ questions based on many interviews and authentic course-ware. Overview of correct/incorrect answers to help you identify your mistakes. Mobile-enabled for smartphones and tablets — study anytime, anywhere. Take this course and measure your readiness for the real certification exam.